Jennifer Murdley's Toad by Bruce Coville. A Magic Shop Book. Review: Do you like magic, toads or both? If so you should read about a schoolgirl that has a magic toad, in Jennifer Murdley's Toad written by Bruce Coville. One day Jennifer Murdley has to wear her brother's underwear to school because all of hers are in the washer. Everything is going wrong for her until Jennifer ends up in this mysterious magic shop. She buys a toad from the shop because she thinks it will be good for her essay. Little does she know, that the little frog will change anything and in the end. She has to find a way to bring everything back to normal. 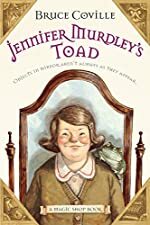 Jennifer Murdley's Toad is perfect for children children between ages 8-10, because it has good vocabulary and is easy to understand. The setting of this book is in a little town, and it's a very realistic setting throughout the entire story. They go to school like normal kids, but the one difference is Jennifer's magic toad starts trouble, which the younger readers will love. This story is a fantasy story with talking toads and a ÒmagicÓ shop that can move place to place, wherever the owner wants to go. Another interesting aspect is the characters in this story are very different from each other. Jennifer wants to be pretty like Sharra and her other friends. Sharra is a show off and acts like the boss. Ellen, Jennifer's best friend cannot keep a secret. Jennifer's little brothers are very weird and annoying. These characters are very original. Jennifer Murdley's Toad is recommended to a girl or boy. We would like to thank Houghton Mifflin Harcourt for providing a copy of Jennifer Murdley's Toad for this review. Have you read Jennifer Murdley's Toad? How would you rate it?